The aquarium has long been a standard for classy, modern homes. Below is the review of EcoQube C plus, where we will discuss everything you need to know before invest money in this aquarium. Not only is it a beautiful way to enhance a front room or living room, but it sends the message that the homeowner cares about the environment and natural creatures and resources. The gentle burbling of the water filter, the presence of lovely aquatic flora, and, of course, those exotic, colorful fish can add so much to an already excellent home. The truth is — your aquarium need LOT of maintenance which otherwise may end up dirty. That being said, aquariums can be a hassle to maintain. Fish are animals and produce waste – waste that has to be cleaned up, usually by emptying the entire tank and liberally applying elbow grease. Not only does this waste water, but it also wastes precious time, and traumatizes the flora and fauna of the tank. Many fish owners have experienced fish dying during transfer or becoming sick as a result of frequent removal from the tank. On top of that, poorly maintained aquariums can infect a home with a sickly, wet, and moldy smell. Meanwhile, if you are just trying to bring a sense of nature to your room hassle-free, here is a smart terrarium with different weather effects that suit you best. 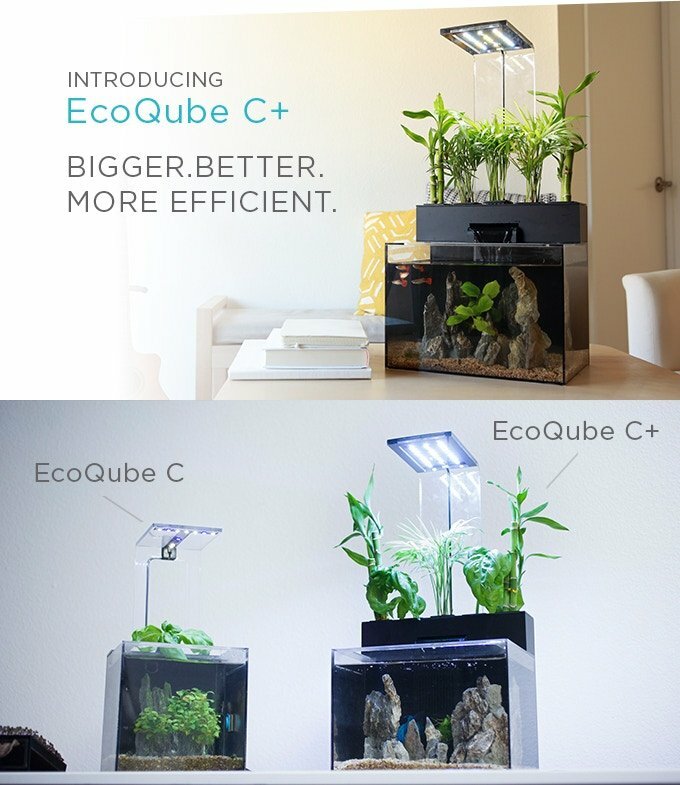 EcoQube C+ Desktop Aquarium – What exactly is this? The modern consumer wants to experience firsthand the soothing presence of nature in the home – but combining the life of Man and Animal can be difficult. EcoQube C+ provides a new, gentle way to combine Nature and our living and workspaces. The EcoQube C+ is a low maintenance ecosystem, available to you for your desktop, bookshelf, or even kitchen. The EcoQube C+ has already sold 10,000 units in 36 countries. What is so beautiful about the EcoQube C+ is that it filters water the same way nature does: first, the fish in your tank do what fish do: they eat their food and produce waste that is rich in ammonia. Second, the healthy bacteria in the water breaks down that ammonia-rich waste into nitrates. Third, the water is filtered through an all natural plant medium of your choice. Fourth, the plants absorb the nitrates as nutrients for their growth! And finally, that cleaned and pure water is transferred back into the now cleaned aquarium, with all the nasty and moldy bits of waste removed. Not only does this save the consumer hassle, but it also saves valuable resources, water, and time. This innovative, all-new system ensures that you will never have to change your dirty water filter again – something nearly all aquarium owners dread. With the EcoQube C+, this nasty chore is a thing of the past. 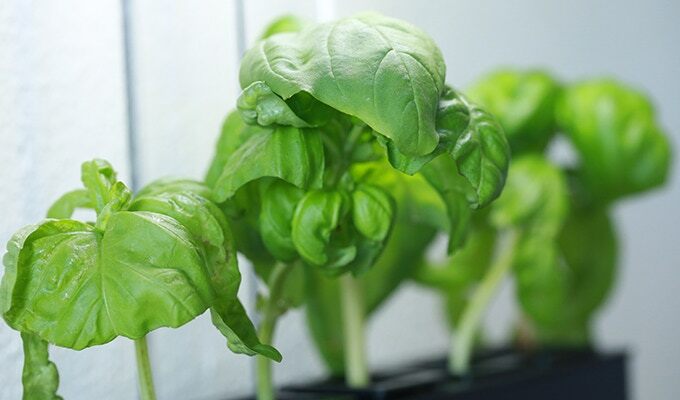 Plus, you can grow up to five kinds of plants and herbs as part of its natural filter – things like basil, bay laurel, chives, mint, lemon balm, rosemary, caraway, garlic, tarragon, and more! Green Onions are noted by the design team as being especially excellent in filtration. 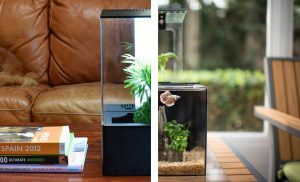 Not only will you have a beautiful, self-cleaning aquarium, but also a rotating selection of fresh herbs for the kitchen. Never spend money on fresh, quality herbs at the store again! Plus, the ability to plant multiple kinds of plants and herbs allows the happy consumer to create a delightful, modern, and intensely unique display for any place in the home or workplace. 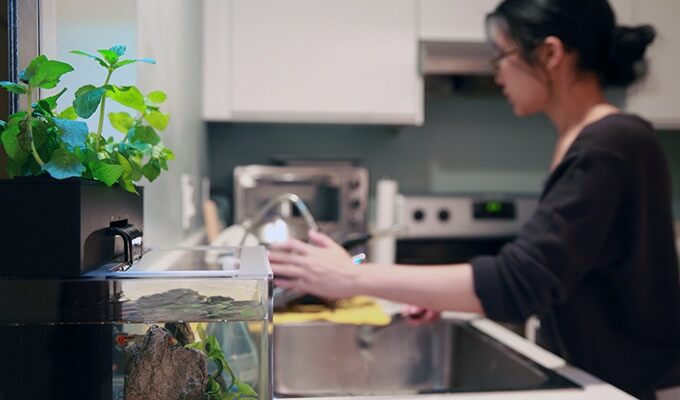 The room temperature water of the EcoQube C+ is especially health for goldfish, white cloud mountain minnows, zebra danios, guppies, and endlers. The design team also recommends Better and Siamese fighting fish. Amano algae eating shrimp and nerite snails are also recommended to assist in the all-natural filtration process. An additional feature of the growth aspect of this aquarium is the ability to grow “micro veggies,” sold as micro green pads, which can sprout in under 10 days. The tank itself is an ample 3 gallons, so there’s plenty of room for all of your pets. Gone are the days of the tiny, dirty fish bowl. The EcoQube C+ even comes with a built-in waterfall, so the soothing and peaceful sound of running water is always present in your home. In their unfaltering commitment to quality, another particularly useful aspect of the EcoQube C+ is its ability to produce different lighting effects via a brushed aluminum LED light panel. This panel can be controlled remotely, even from across the house and in a different room, from an App for your smartphone. 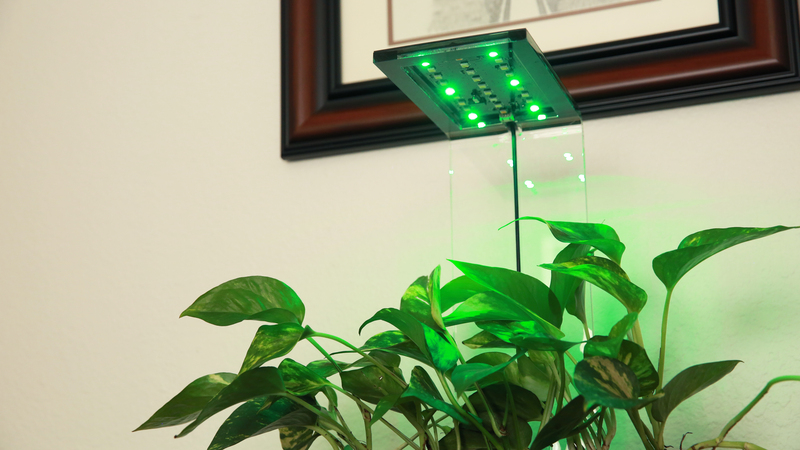 These LED lights also act as a replacement for sunlight, so you can grow your plants and herbs anywhere in the home without worrying about garnering enough natural light. Sunlight can actually be a problem for aquariums – all that extra energy contributes to the growth of algae and harmful bacteria that can really hurt your tank’s flora and fauna. The LED panels come with a built-in 12-hour timer that turns on and off your light and can cycle through modes like Grow Mode and Night mode. It also includes fun and useful modes like Rainbow, which cycles through all the colors of the rainbow, and Moon, a mode where low temperature white and red lights are mixed and activated. This mode can help to activate your circadian rhythm and is linked by many studies to helping you fall asleep faster. The LED panels are designed and tested to run over 10 years at 9 hours per day of run time. 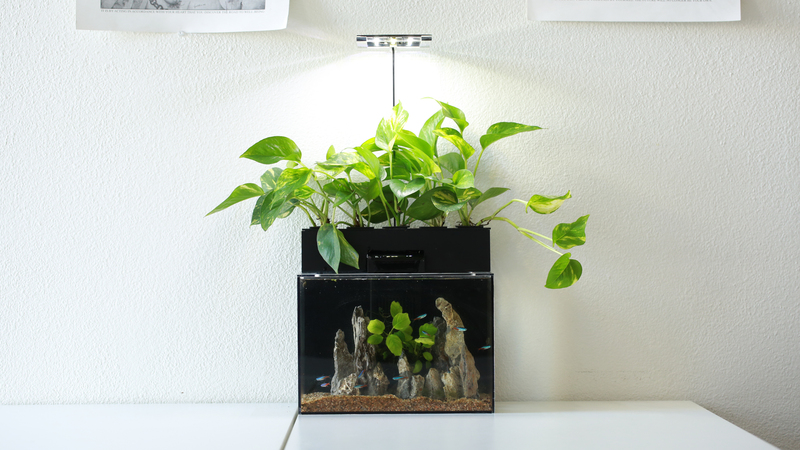 The LED panel can be supplemented by a paid add-on of UV light – the tank stays perfectly clean without it, but it can be helpful in fending off micro-bacteria and other troublesome tank pests. Most small tanks do not require any additional UV protection, so some consumers have considered this add on a luxury. However, it speaks well to the product and the production that such a luxury add-on is even available. The base model of the EcoQube C+ is 10” x 13” x 13”, weighs about 10 pounds, and has a 3-gallon volume. It is significantly larger and more efficient than the previous models — EcoQube C (It is available on Amazon now). Early comments on the Kickstarter note that it was first produced without a lid for the tank – this has since been remedied. The unit is now sold with an attractive, functional lid that helps to keep dust, pollen, and other pollutants out of the water. The design team seems quick and polite in addressing the concerns of the consumers. Other consumers have also noted that there is no hole in the lid for a heating cable or additional filter cable – the designers have stated that this is because the tank is designed to function at room temperature with fresh water. These are important to note when choosing your flora and fauna. Some more exotic fish and plants may require salt water or water that is hotter or colder than room temperature. You will also want to ensure that your tank is in a temperature stable area, where the temperature will not fluctuate enough to affect the health of your plants and fish. The second generation, EcoQube C+, is now available for only $99 while you can save up to 50% off their future retail price. Also, the EcoQube C+ comes with a limited warranty for 12 months. This warranty ensures that the product, when it arrives, is free of defective parts. It does not cover breakage or problems from normal use, wear, and tear. The product may also not be modified, or the warranty will be broken. This project is currently on Indiegogo. A little effort is still required for this "self-maintaining" aquarium. Glad you like it! We are new but we aim to provide a nice place where people can freely comment and rate around a new product. It’s important for those who’re looking for some customer-base pre-sale reviews before even backing a project. Please let us know where to improve, you opinion mean a lot to us! Thanks again pal.